I am not much for jumping on band-wagons, but I am always interested in seeing what other people are doing. Combine the fascination with pop-culture (or any culture) with a date with my wife and you have a great reason to see the Hunger Games movie that just came out. I am not a fan of the books, because I have never read them. I did not go into the movie with any agenda other than to see what everyone was raving about and to be possibly entertained for a few hours. Less than half-way through the movie I was shocked, but unfortunately not appalled because I have seen this kind of thing too many times in real life. “TOO MANY TIMES!? !” You may be wondering where I would have seen this type of futuristic world or gladiatorial games featuring children, and honestly that was not the part that looked so familiar to me, for the devil is in the details. I noticed the contrast between the poor outlying districts and The Capitol. I noticed these older teenage tributes being unfamiliar with the trappings of luxury and wealth they first encountered on their way to The Capitol. I noticed how the capital gained its economic support from the same people it oppressed. I noticed the difference between the futuristic weaponry of the guards and the bow and arrow that Katniss was hunting with in the beginning of the movie. I noticed the gaps in education and training between the tributes from districts 1 and 2 and districts 11 and 12. I noticed the ability people had to pop mutant dogs out of the ground, but how this same ability was not used to provide food for the hungry members of their society. I noticed these things because I have seen them before. 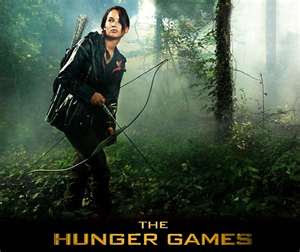 The Hunger Games paints a vivid picture of our current world’s economy and social practices. When we come back to the US after being in Tanzania for a long period of time we almost always experience reverse culture shock, that point at which just being in Wal-Mart is overwhelming. It passes, but it is this traveling between two very different cultures that exist in the same world that I feel is so well portrayed in Hunger Games. From the time Katniss and Peta step on the train until the time that they step at The Capitol you can see a vivid portrayal of two different worlds in regards to technology, resources, and the very live-styles of people (survival versus thriving). You can see this same contrast with a 24 hour plane ride between the US and East Africa (and I would guess other places as well). The startling comparisons don’t end there. In order to see the economic support of a large, entertainment based empire by cheap labor and resources look no further than the Congo and conflict minerals, or Tanzania and its gold mines. To find people unfamiliar with the technology and luxury that many of us take for granted look no further than the village women that are amazed by the idea of a laundry machine or an ultra sound to check a baby’s health status before she is even born. To see the difference in preparedness for the game of life portrayed in the different levels of tributes look no further than the difference in education systems world-wide and the difference in access to technology between the majority world (third world) and post-industrialized nations such as the US. There are more comparisons to be had and I could go into greater detail, because the movie really does a great job of portraying some of these things. I did not go into the movie intending to see any of this, but it was impossible not to notice the differences in the capital and the districts when it is a difference I am living right now. Think about this when you go to watch the movie for the first time or the second time. Think about it because with today’s increasingly globalized economy and society the countries with technology and educational resources are in danger of becoming The Capital if we are not more careful in our use of resources and more intentional in building bridges instead of barriers.